Plant based by-products are naturally available in large quantities and they can be exploited as cheap and feasible substrate for their biological transformation into valuable products. Date palm is a good example from plant source having a great value for its by-products owing to presence of cellulosic material that can be converted into valuable products like glucose and lactic acid as an option to reduce environmental pollution. Production of glucose from cellulosic date palm waste can be achieved with the help of cellulose enzyme from selective microorganisms. Similarly, date palm cellulosic material can also be converted into lactic acid with the help of lactic acid bacteria through fermentation process. Conditions may be optimized for the production of glucose and lactic acid during fermentation process. Lactic acid production is decreased if the substrate concentration is high initially in the fermentation experiment while maximum production is achieved by increasing the enzyme concentration in the experiment. The desirable yield of glucose can be achieved at 50 °C and pH of 5.0. Adopting a two-step hydrolysis process can increase the glucose production by 94.88% in 24 h process. Lactic acid yield can be achieved maximum at temperature 40–45 °C and pH 6. These results are promising and these suggest that yield of sugar and lactic acid from date palm waste is practical and it may be employed as a best practice to minimize the environmental pollution by using date palm cellulosic by-products as an inexpensive source. 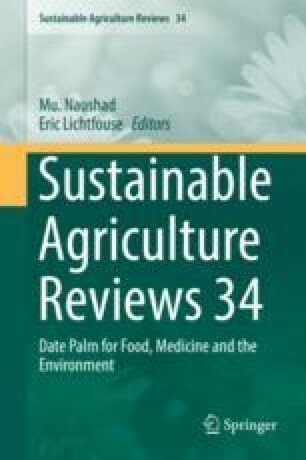 This chapter envisage the suitability of date palm waste as inexpensive cellulosic source for obtaining commercially valuable products i.e. glucose and lactic acid.